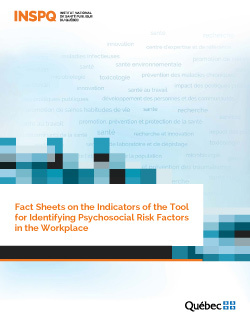 This collection of fact sheets, which was prepared in response to numerous requests for simple and accurate information on psychosocial risk (PSR) factors in the workplace, is intended to serve as a practical tool for occupational health workers as a whole. The fact sheets were drawn up by experts from the Équipe de prévention des risques psychosociaux du travail et promotion de la santé des travailleurs (Team for the prevention of psychosocial risk factors in the workplace and the promotion of workers’ health) of the Institut national de santé publique du Québec (INSPQ), in collaboration with the Groupe scientifique sur l’impact des conditions et de l’organisation du travail sur la santé (Scientific panel on the impact of working conditions and work organization on health), made up of researchers and specialists in the field. These fact sheets supplement the Tool for Identifying Psychosocial Risk Factors in the Workplace, whose use requires comprehensive training also developed by the INSPQ. Readers can also consult this collection of fact sheets on the Web site of the INSPQ and download each one in PDF format. Online training on the identification and prevention of psychosocial risk factors in the workplace is available on the Web site as well: Risques psychosociaux au travail : de l’identification à la prévention (French only).